The VIP opening of Maison St-Germain, attracted the lovely Chloe Wise, Ben Bronfman, and Kate Foley to celebrate with landscape artist, Lily Kwong. 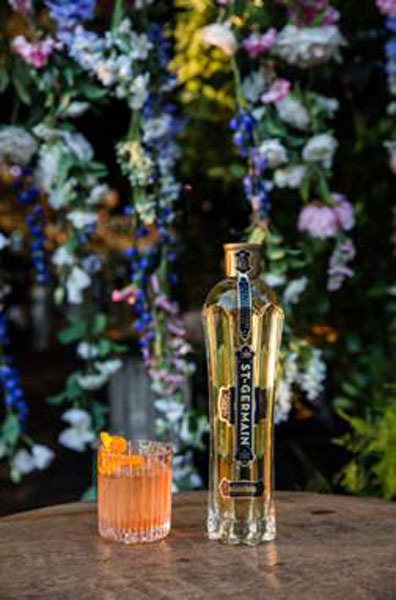 In celebration of delicate elderflowers harvested once a year to create St-Germain French liqueur, Lily Kwong created a geometric hedge and canopy of fresh flora and fauna with Dan Flavin-inspired luminosity for the exclusive private event which took place on the ever stunning High Line in New York City. Here Resident Magazine sat down with the talented and artful Lily Kwong to discuss her inspirations and passions of landscaping. 1. How were you inspired to bring the essence of St Germain to life? Inspired by St-Germain’s French roots, I designed a 16th-century labyrinth and added modern elements like performance, botanical art and light installation. It felt important to visualize the mind-blowing fact that each bottle of St-Germain is composed of 1,000 delicate elderflowers (handpicked once a year in Europe), so we hand-constructed a hanging installation of thousands of flowers modeled after rolling hills that interplay with the existing neon lighting. Every design element is meant to disorient, delight and inspire an awe for nature on the summer solstice. 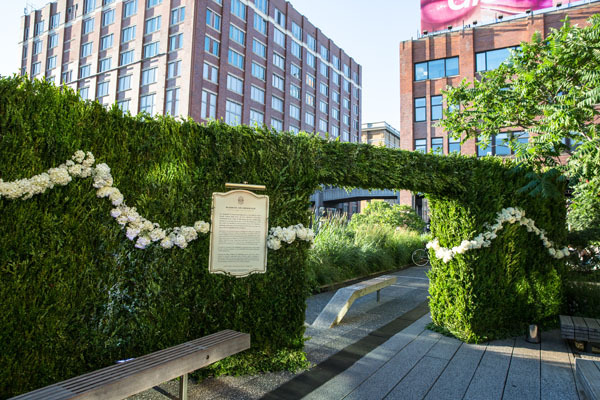 The concept grew out of this idea – in the end, we installed over 13,000 flowers and 200 linear feet of green walls on the High Line. I use landscape as a vehicle to connect with other art forms as well, so I was excited to pull in friends and collaborators to add another dimension to the greenscape. I tapped Artistic Director Mafalda Millies and choreographer Nathan Mitchell to create the “The-Solar-Do-Nothing-Dance,” in honor of the solstice and of Eames’ invention that turned solar energy into electricity. My inspiring friend Mia Moretti, part of the all-female arts collective Chez Conversations, was on the 1s and 2s on opening night, and my longtime collaborator, stylist Laura Jones, stepped up to dress our St-Germain team in all sustainable clothing. St-Germain really empowered me to express my design vision, and in the process gave a platform to so many gifted artists to create an extraordinary installation on one of New York’s most iconic landmarks. 2. How did you come to choose the particular flowers for the arrangement? We brought over 13,000 flowers to the High Line and hand-constructed them into beautiful curtains and grids, inspired by a vintage photo I found of a cabaret with hanging florals on the Champs-Élysées from the 1920s. We started working the amazing florists from Botanica weeks before the event to source peonies, Queen Anne’s Lace, hydrangeas, roses, wisteria, delphinium, ranunculus viburnum, lilies and more. The green walls are hand-made with cuttings from boxwood & huckleberries (which happens to be my brother’s name!). Insanely enough, we only had from midnight before the event to load our florals onto the High Line, and construction began just 12 hours before the event so the blooms were as fresh as possible. It took a sleepless night and lots of fortitude to turn this vision into a reality! 3. What do you love most about working with urban landscape design and how did you come into this area? I applied to Columbia University for a degree in urban planning, and graduated with a BA in 2012. A lot of the classes focused on sustainability and green infrastructure, and I began to think about ecological issues. Following that, I spearheaded a project with American Forests’ reforestation program and sustainable brand, Amour Verte (French for “green love”), to plant 100,000 trees across North America. Reconnecting with plants and nature has cracked open my life. Getting my hands in the dirt, exploring organic beauty, and designing in harmony with nature has reconnected me with my creativity and my community. Working with plant life has taught me patience, compassion, mindfulness – all those juicy life lessons. It satisfies all the dimensions of my personality: I get to do research, draw, travel, get cerebral, get physical, be outside, be chained to a computer, work with big teams, collaborate with other artists. At the end of the day what I enjoy most about this field is I know I’m working towards a greater mission of creating a more beautiful, sustainable future. The High Line made me fall in love with urban planning and landscape design – to me, it’s a masterpiece. I wanted to honor the existing industrial architecture of the site, and build on its linear form by drawing inspiration from traditional hedge mazes.